I need some information which is not too common. I want to build a 25ft clinker boat, old fashioned. with the spoke shave (planning) corners, fastening with rivets. To get started I need to choose the timber type in preference. The priority is 1-bending 2-workability 3-durability in that I don't want it breaking easily or getting damaged. I am not worried about long term rot. I hear that I can get boat skin larch, iroko, ash, oak, and generally from Robbins.co.uk which should I go for? From a post on this site Ash seems to be the best all around for this application, is that so? Can anyone also tell me the how thick these planks for the hull should be? 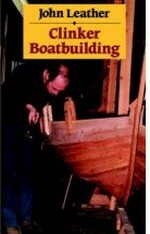 Boat length-overall to beam ratios vary from 2:1 to as much as 5:1. Yours seems to be in that extreme category, which would probably need some ballast low down to keep it stable. The hull shape can also have an effect on stability. I theory a clinker hull shouldn’t have gaps between the planks. Each plank should be overlapping and pressed close to the one below, and when the wood ‘takes up’ they should press more closely. You can use a flexible sealant to be on the safe side. I think that I will go for the Ash, even on the outside, because I don't plan to keep the boat for more than a year. Should I use ash for the keel as well? Can I get that from Robbins? I live in Edinburgh so I might ask them to ship it up. My designs are from denmark. I don't have the designer's name on them though. A student from their university sent me them. The length is 10-12m and beam is 2.5m. Is that not a bit thin though? Will it be stable? The one thing the plans don't talk about is the chauking. How to you fill the gaps in a clinker? Sikaflex? Should you not put some kind of rope in them first or a bigger filler then sikaflex. Tar would take forever to dry. Best and thanks for the replies! They are all excellent boat building timbers. And having myself bought timber from ?Robbins? I can vouch for their service. Oak has, since the beginning of time been a favorite for frames and backbone timbers. And larch has been used to plank generations of wooden boats around the UK. But then so too has fir and pine, which is what the Norse used to build their clinker, long ships. Iroko is good too but it can be a bugger to plane to a good finish because of the erratic grain. Ash does have a superior strength to weight ratio than oak and it does bend easily, but it will darken and stain quite badly with exposure, which could be a problem if you wanted a natural finish. Might also be worth asking Robins if they keep the particular timber/timbers you decide on, in stock or do they have to order it in. I'm just thinking about if you need a bit extra at some time, or if you want to buy it as you go along.